Let’s get this out of the way from the start: the new exoplanet discovery announced yesterday is exciting for a number of reasons, but its resemblance to Earth is not one of them. It’s not “Earth’s twin” (as several news outlets have proclaimed): Kepler-22b, as it is known, is 2.4 times the radius of Earth, which is noticeably larger than our home world. NASA scientists aren’t even certain whether it has a solid surface or not, since it sits at the border between the gaseous Jovian planets and the rocky terrestrial planets. Until the mass of the exoplanet is known more precisely, we won’t have a good idea of its composition, but I think it’s pretty clear that even if it has a solid surface, it’s not going to be particularly Earthlike. (The Kepler mission finds exoplanets using transits, when the planet crosses the disc of its host star; this method is often better at finding sizes than masses, at least initially. To measure masses accurately, we need to observe it for more orbits.) The exoplanet team at Arecibo in Puerto Rico gives a first estimate of Kepler-22b’s mass to be possibly as much as 35 times the mass of Earth, which is twice the mass of Neptune! (Update: This number is an upper bound, though: it’s probably less than that.) Better data will help settle the question fairly soon, but if they’re anywhere remotely close in their estimate, Kepler-22b can’t be terrestrial. Hype aside (which is not supported by the original press release), Kepler-22b is a very interesting discovery, largely because the star it orbits is a slightly smaller version of our Sun: a yellow star. Even more significantly, it orbits at the right distance to be in its star’s “habitable zone”; more about what that means momentarily. Astronomers have found several exoplanets in the habitable zones of their stars, but those stars were all smaller and redder than our Sun, putting the planets very close in compared to Earth. The temperature of the host star: the hotter the star, the more it emits light of all wavelengths. This includes infrared light, which is the most important for keeping a planet warm. For a cooler, redder star, the habitable zone is close in; for a hotter, whiter star, the habitable zone will be farther away. If the temperature of the host star is too hot, there might be too much ultraviolet radiation for life to exist comfortably. The size of the host star: a large star emits more light from its surface simply because there is more surface area. If we confine our studies to main-sequence stars (stars in the prime of their lives, like our Sun), temperature and size are directly related: larger stars are hotter, smaller stars are cooler. The albedo of the planet: how much light gets reflected back into space. It doesn’t matter if a planet receives lots of light if it just reflects it right back; conversely, a planet that absorbs more light can afford to sit a little farther away from its host star and still stay warm. Icy Enceladus has a very high albedo, while our gray rocky Moon has a very low albedo. Earth reflects about 30% of sunlight on average due to clouds and oceans. Hand in hand with albedo comes the composition of the planet’s atmosphere—if it has one. Greenhouse gases (water, carbon dioxide, methane, and so forth) are efficient absorbers of infrared light, so their presence in an atmosphere helps retain warmth. Without these chemicals in our atmosphere, Earth would be frozen: it is too far from the Sun for water to stay liquid. As Caleb Scharf points out, saying that Kepler-22b is in the habitable zone assumes it has the same atmospheric composition and albedo that Earth has. That’s a very strong assumption: no planet in our own Solar System has the same composition, especially not our twin world Venus: though it’s nearly the same size as Earth and definitely lies within the habitable zone, its atmosphere is mostly carbon dioxide, giving it a scorchingly-hot surface temperature day and night. Mars once had liquid water and large oceans, but for reasons that are still somewhat mysterious that water is gone, and current conditions—including cold temperatures for much of the planet—preclude it from coming back. To make things even more interesting, the moons Enceladus (orbiting Saturn) and Europa (orbiting Jupiter) have a lot of liquid water and possibly the right chemical soup for life, but they’re far out of the habitable zone! Instead of substantial atmospheres, they have a thick layer of ice protecting the water beneath; gravitational tidal activity from their host planets and internal heat keep the water liquid, rather than light from the Sun. In fact, with such high albedo, very little of the sparse sunlight falling on the moons acts to warm the moons at all! Nevertheless, the discovery of Kepler-22b is a noteworthy achievement, and one that is closer to an Earthlike orbit, even though the planet itself is very unlike Earth. Habitability is a complex and fascinating notion, and of course until/unless we discover life on another world, we can’t be absolutely certain what conditions are truly “just right”. Update: Here’s Phil Plait’s take on the same questions, which I unaccountably missed when he posted it yesterday, and Maggie Koerth-Baker’s summary at Boing-Boing. Since her article links to Bad Astronomy and my post, does this create an infinite loop? Another important factor; even if Kepler 22b is terrestrial and has liquid water is internal activity or basically plate tectonics. Unless there is a dynamic process to regulate surface and atmospheric composition then even if the planet can support life now; it may not be able to in the future. Stars do not remain consent (even our Sun hasn’t done so over the last 4 Billion years) so unless there is a process where the atmosphere can regulate it’s composition the situation will be unstable over the longer term. Plate Tectonics is vital in that process and that cannot take place without liquid water. If the planet is too small or cannot generate enough internal heat to maintain active plate tectonics then it will stop. This seems to have happened on Mars; not enough internal heat for proper plate tectonics so when the atmosphere stopped being replenished gravity was not able to hold onto enough atmosphere to keep liquid water on the surface. No further plate tectonics. Not that rules out the possibility for life on Mars but it does restrict the possibilities. Venus is a stranger case; it has the mass for plate tectonics but perhaps lacks enough internal heat to keep it going? Water is no longer liquid and that puts the breaks on plate tectonics. With higher gravity then the atmosphere does not dissipate but builds up and the situation is then static with high pressures and high temperatures. Not a happy prospect for life. I must admit that this is the 1st I’ve heard of this discovery. 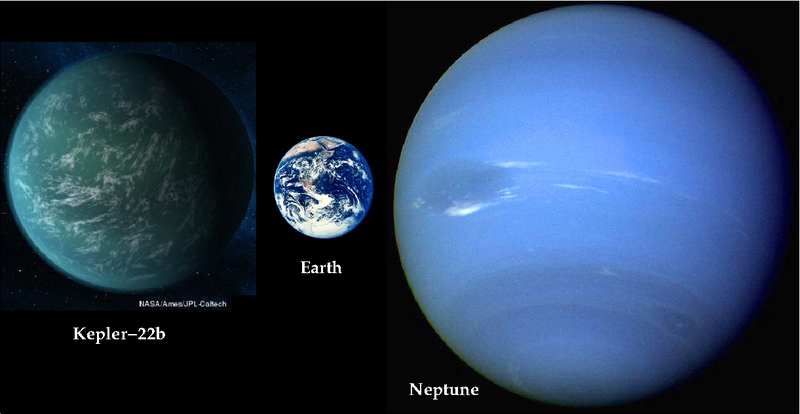 You mentioned “Kepler-22b, as it is known, is 2.4 times the radius of Earth”. I think you meant diameter. 2 x radius would mean that it is the same size as Earth, and 2.4 times is not significantly larger. This was a very interesting read. Thank you for your post.